[A supporter found this interesting little pamphlet that someone put together. 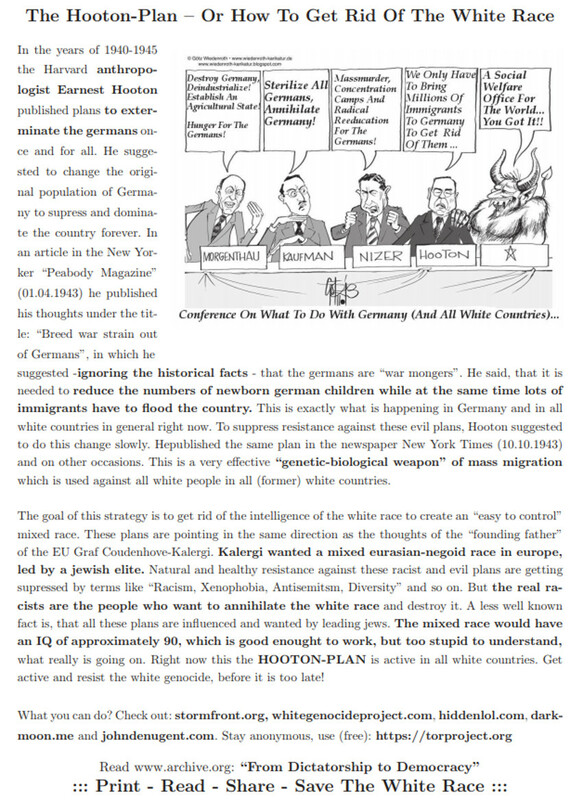 This is similar to the book by the Jewish POS Kaufman who wrote the book "Germany must perish” in 1943. He said that all the German men must be sterilised so that they could not have children and so that the Germans would perish from the face of the Earth within a single generation. Kaufman even drew up a map showing how Germany must be partitioned between its neighbours so that Germany ceases to exist. The Jew Kalergi also had his plan to destroy all of of Europe and to down-breed the whites. This is the first time I’ve come across the Hooton plan. This is a similar despicable Jewish plan. What is astounding is how the Jews can publish this stuff and say this stuff in public. The bottom line is that Jews are so well received by whites and treated too well. So Jews can walk among us and throw their malicious diseased ideas among our people because sometimes whites carry out the sick Jewish plans. Luckily whites were not demented enough to actually listen. I have my own views as to why Whites as a race must return to a war-like society like we were in the time of the Roman Empire. Its based on some simple realities of life. I’ll explain it in videos at some point.